Australian novelist Keneally (Schindler’s List, 1982, etc.) turns to his native country in a time of war. Anticipating the centennial of World War I by a shade, Keneally constructs a Winds of War–like epic concerning figures whom only Ernest Hemingway, among the first-tier writers, got to: military nurses. 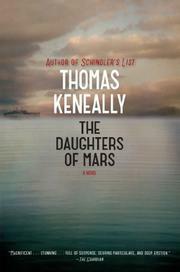 Naomi and Sally Durance are two sisters who join the Nursing Corps in 1915 and sail off to Gallipoli, where they witness terrible things and form bonds of attachment with the wounded soldiers who suffer them; no one with a sensitive stomach will want to read Keneally’s descriptions of their wounds. Crossing the Mediterranean, they experience the further terror of being torpedoed. Keneally’s set piece, which takes up nearly a tenth of this long but economical book, is extraordinarily moving, if often quite gruesome (“Within the ambit of Lemnos floated a boat with four putrefying dead soldiers and three dead nurses in it”). Since Keneally has established soldiers and nurses alike as characters, the reader experiences their loss. Only on arriving at the Western Front do the sisters part, and there they discover “a dimension of barbarity that had not existed on Gallipoli and had been undreamed of in Archimedes,” namely the terror of gas warfare. There, too, each falls in love, which, this being a war story, cannot end well for the both; it is only the love-story element that does not entirely work in Keneally’s book, though it seems inevitable. For all that, Keneally is a master of character development and period detail, and there are no false notes there. Fans of Downton Abbey and Gallipoli alike will find much to admire in Keneally’s fast-moving, flawlessly written pages.